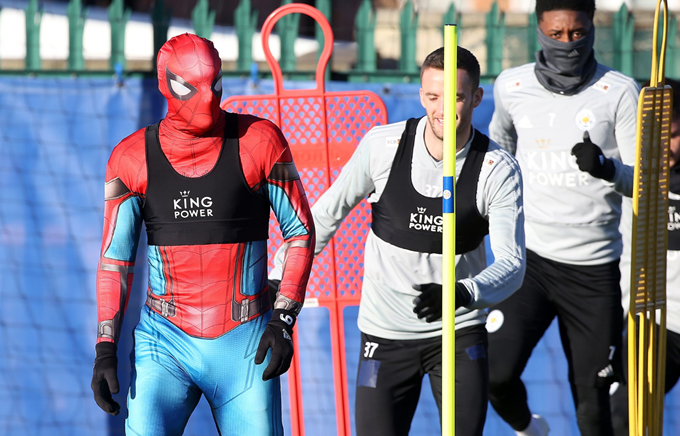 Leicester City were paid a little visit on Thursday morning when Spiderman arrived at their training ground. Having hid in the bushes at the club’s training ground before leaping out and slinging a web at a mystified Claude Puel. The club invited fans to guess just who was inside the costume seemingly unaware that, having seen his jawline in profile, it could only really be one person. Lo and behold, it was Jamie Vardy and for absolutely no reason! The Foxes manager reacted saying that he wasn’t surprised at when he discovered it was Jamie Vardy.